My friends IHM tagged me first and then Smitha also asked me to do this tag, thanks to both of you! 1. I used to climb trees when I was small...small type coconut trees, cashew trees, mango trees etc., which were at home in my grandma's place. Used to jump from heights chasing our dog or calf, which were at home then, to my grandma's horror! Girls were not supposed to run like that in those days! During summer holidays, played cricket with my cousins (all were boys and I was the only girl! ), I was mostly like the 12th (wo)man. I did my best in bowling and batting! I taught my sons to play top and marbles! 2. My school, had a nice, big playground and liked playing all games from football (! ), tennis, throw ball etc., I was not very good, though! Loved hanging in parallel bars and other exercise gadgets in our school. It was a girls school! 3. Love to READ BOOKS. Used to feel uneasy if I didn't read at least some pages before going to sleep, though the habit is slowing down now. 4. Love all gadgets, camera, cell phones, laptops etc. Dream of driving is not fulfilled, though! 5. I don't use make-up on normal days. Just use minimal make-up for important functions. 6. Not very much interested in jewellery! 7. Interested in discussing about politics. Like to watch news channels than serials! 8. I am not scared of dark and don't get upset easily, if any unusual incident happened. Start thinking about the next step to be taken. But get tensed up for small small things! 10. I like beige, khaaki colour than pink and I don't hate blue, IHM! Edited to add (02.07.10): Thanks IHM for this beautiful badge...I am overwhelmed! Hmmmm, I am done with my tag, now, whom to tag? IHM asks me to tag 12 people (OMG) and she has done that and Smitha tagged the rest! Who is remaining? 'According to IHM, if you read this and you don’t take the tag up , you are, ‘cursed' to wear blue clothes/pants if you are a woman and pink shirts if you are a man – for the next twelve years’! Let me try to tag these people, whom I think are not yet tagged - it will not come to 12, though and I am ready to do whatever IHM wants me to do for not doing this, huh! Here’s the rules of the tag – Please list at least ten things you have ever wanted to do or did which your gender is not supposed to. 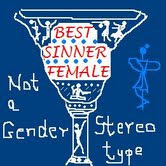 The tag is called ‘My Sins against Gender-Stereotypes’. You climbed trees and chased your dog and your calf... that must have been such fun!! Sandhya that's an awesome childhood to have.. space and nature!! LOL@ being the 12th wo(man)...not fair! I am scared of the dark - even now, but I take care to keep a torch and an emergency light around. My granddad disapproved of my being scared but my brother was the one who had a tough childhood for the same fears I felt :( just because he was a boy. You were naturally a normal child and were at the right place at right time. Nice one. Now we know some more stuff about you. IHM: I didn't notice the line about dog bite...I don't like it either. Yes, my grandma's house in Udupi was a huge one with separate area for trees, banana plants, flowers and fruits! Now, the flats have taken over that place. We had a very happy period living there. Good to know that your sister is like me! My nephew is so careful that he keeps two torches...if one goes off to use the other, one bamboo stick to hit the thief and some crackers in the hall shelf, to alert neighbours in an emergency! Your brother must have been young at that time, he must have overcome the fear by now, IHM. I loved doing this tag, IHM! BK Chowla: Yes, I had, thank you, Chowlaji! I did a post on a different song earlier from this movie! Like you, I must have seen this movie umpteen times! My mother and her sisters started discussing politics after coming to the city and after watching television! We are experts in it now because of the television and print media. Yes, we are all sinners in some way or the other! SG: Thank you, SG! Will you take this tag and tell us a little about yourself?! and thank you for tagging me ! will take it up soon. I loved your list too Sandhya! Yes, Climbing trees is fun! marbles! me too!! I love all the songs from the movie... Sigh! amazing! It was fun to read Sandhya. I have been tagged by Meira also to do this tag. Climbing trees must have been fun. I never tried it, where are the trees in the city? Renu: I am very eager to know more about you, Renu! Pixie: Yes, it was fun doing this tag, Pixie! R.Ramesh: Achchachcho...what happened? Please read my post, Ramesh! And comment! Waiting eagerly to see your version, Bikram! Aparna: Please do the tag, Aparna! It will be fun. Enjoy doing it like I did! Please visit IHM for the rules. kanagu: Waiting eagerly to read your version...! That was so much fun to read, Sandhya! Climbing coconut trees! I am so impressed! That is something! Wow! So many things we all do, which are considered a 'male forte', isn't it? It just goes on to show how mindsets are so prejudiced, despite the fact that most of us defy the norms, in more ways than one! wordsndreamz: Is Poohi better now? These are secondary, Smitha! Take care of her. Yes, I enjoyed the period I was with my grandmother. I wonder if I would have approved of my daughter doing this...we would be worried of their injuries! No one bothered in those days...that was sort of made us what we are today, I think...we don't get scared that easily about anything! I peel coconut even now with an arivaal (big knife)..my sons were not interested to try even and I doubt again of the injuries! This tag was fun to write and read too, right? vimmuuu: Let me help you, vimmuuu! Normal women watch Ekta serials and cry with the characters! We don't cry for that reason! We are DIFFERENT! Ramesh: Good boy! Thank you! Such a fun read, Sandhya! You climbed coconut trees..wow!! Impressive! Oh I always wanted to learn to play tops and marbles you know..I tried so many times but never succeeded. My husband and I both have this habit of reading before going to sleep too. deepsspeakingup: The coconut trees are of small size, like Kerala tree type. It was slightly slanting and not very tough to climb! You know what, I loved to eat the tiny coconut seeds, as a small kid. I was spoiling my other male cousins also, offering these to them! It was not very tasty, though, if I remember correctly! I think either gender have their ups and downs - talents and blunders. Its more important that we think like one people. Sandhya..... Its reading what I meant. READING BOOKS !! what does that got to do with gender ?? vimmuuu: Ohfo! People of my generation don't need to read books before going to sleep. I was a bookworm since my childhood days, unlike my other female relatives. Even now, many of them just live in their cocoon...just cooking, cleaning, monitoring their children's studies (some of them get feverish when their children have exams, literally!). Then TV is there! Sharda: Welcome here, Sharda! Thank you! Climbing coconut tree is not easy -i know it as i have tried it so many times and failed.Teaching marble wohoo....nice idea,gotta buy some for my son.Interesting tag Sandhya and thanks for tagging me. Nice list Sandhya :) Dint know even you were a sinner! Even I like stitching, embroidery etc but I am a sinner nevertheless ! Hi Sandhya. I've been dormant on the blog space for nearly a month. Just completed the tag. Do take a look. Yours was interesting. I think you must have been a pretty cool mom teaching your sons to spin the top and play marbles! kavita: The coconut trees were not the tall ones, they were Kerala type red coconut trees and short in size. At that age, we never bothered about scratches or wounds! Playing marbles and spinning tops were fun with the children. I taught them skipping too and I used to jump with my son in my forties too! I miss all those things now, because age related weaknesses have started settling in! Pleas do the tag and enjoy knowing yourself, like I did! Ramesh: They are really very good, Ramesh. evanescentthoughts: Would love to read about the list of your sins, Ashwini! Deepa: Having dogs is really enjoyable, Deepa. We did that for 11 years! Been so long Sandhya .. hw r u dng? Chandrika: Those were THE days, Chandrika! Thank you Swaram and Kanagu. My sis in law's grand daughter's wedding was there, yesterday and so I was busy. Have got people at home. Will be free from Monday. Thanks for the concern, Kanagu and Swaram. I felt happy reading your message. my turn to ask - Busy? Radha: Family wedding! Will be back after Monday. Oh u used to climb coconut trees and that was supposed to be fully male dominated,i used to climb walls. Not interested in jewellery,i love but not the heavy ones,just simple and small things. Sorry for not including your name. I will be happy to know more about you, Sarita. Please do the tag. And this list is so so like mine :) :) Enjoyed it v. much! Bikram: I am back, thank you! Usha Pisharody: Welcome here, to my blog, Usha! I am a great admirer of you...I had been reading your comments in many posts of my friends and have read some of your posts too. And we are animal lovers!